The Parliamentary Assembly of the Council of Europe has adopted a resolution stating that the Donetsk and Luhansk “People’s Republics” (“LNR,” “DNR”) two statelets in eastern Ukraine waging war against Kyiv, are “effectively controlled” by the Russian Federation, European Pravda reports from Strasbourg. Titled “State of emergency: proportionality issues concerning derogations under Article 15 of the European Convention on Human Rights,” the resolution is dedicated to cases of suspension of separate articles of the European convention on human rights. Three countries – Ukraine (after the Russian invasion), France (after terrorist attacks), and Turkey (after the coup attempt) have enacted such suspensions. 98-100 MPs voted in support, and 3-4 – against the two amendments. Particularly, MPs from traditionally pro-Russian powers – the German Die Linke and Alternative für Deutschland, and the Dutch Social Party turned them down. In this resolution, PACE confirmed its condemnation of Russian aggression against Ukraine, which is conducted in violation of international humanitarian law and principles of the Council of Europe. 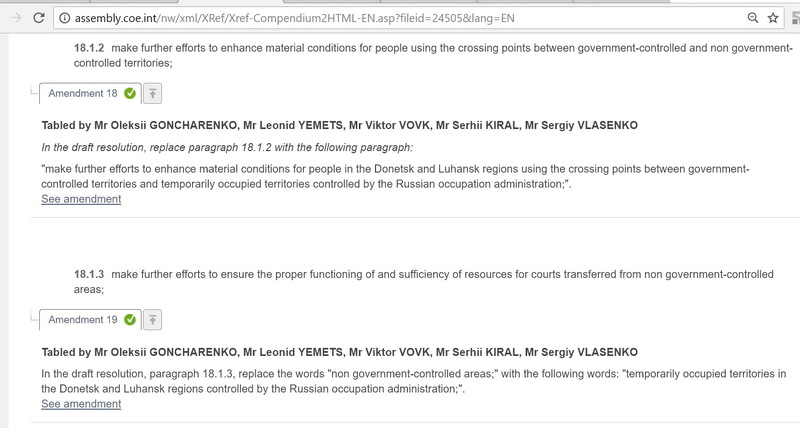 Initially, even stronger changes were planned, Yevropeiska Pravda noted: the proposed amendments were to give ORDLO the status of “temporarily occupied territories managed by the Russian occupation administration.” However, in the end, oral subamendments were proposed, in which the Ukrainian MPs turned down the phrase about “occupation.” The outlet supposes this was done in order to ensure that the amendments would have stronger support. The entire resolution, although containing the old amendment formulas, is available here.